Searching for a sturdy iPad case for the classroom or for personal use? I was sent a Brenthaven BX2™ Edge protective case to try out. I have an iPad Mini 4 and put the case on two weeks ago and have been using it ever since. The BX2™ Edge is available for the iPad Air, the iPad Air 2, and all versions of the iPad Mini (1-3 and 4). The case is a protective case, intended for schools, but having one on my personal device has been great! There was a lot of thought put into the the design of the case. The case is is a one-piece full case for the iPad. The case latches shut which both protects the iPad's screen as well as keeps the screen off. And the case comes in bright colors, including my favorite yellow! The case has a clear back which allows for an asset tag to show through and also includes bumpers to protect the device. A very useful feature, which is missing from many cases, is the ability, when the front cover is flapped around to the back of the device, to fold down the corner to allow access to the camera lens. Brilliant! There is a slot on the back of the case that allows the latch to slide in to hold the iPad sturdily in both typing and viewing mode. 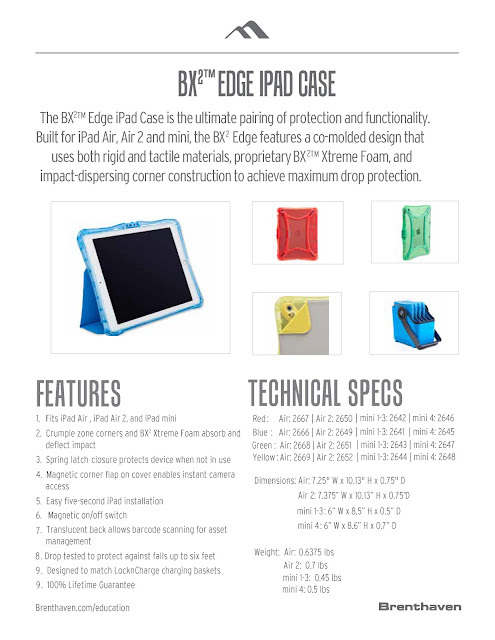 Here is the most current information sheet on the Brenthaven BX2™ Edge iPad case. The Web site does not have the color options, yet, so, please ask your rep for more information!